In this terrifying and hilarious prequel, we witness the genesis of the zombie plague in early-nineteenth-century England. We watch Elizabeth Bennet evolve from a naïve young teenager into a savage slayer of the undead. We laugh as she begins her first clumsy training with nunchucks and katana swords and cry when her first blush with romance goes tragically awry. Written by acclaimed novelist (and Edgar Award nominee) Steve Hockensmith, Dawn of the Dreadfuls invites Austen fans to step back into Regency England, Land of the Undead! I loved Pride and Prejudice and Zombies, so I was extremely excited to read the prequel. But, I was disappointed. One of the best things about PPZ was that it was a shameless zombie infested parody novel. It had so-bad-you-have-to-laugh puns and constant puking just for the sake of puking. It didn't take itself seriously at all. But in Dawn of the Dreadfuls, it's a different author, so of course, there are going to be differences in writing style and characterization. But it just wasn't as funny. There were some moments where I chuckled, but overall, it was more of a novel than a parody. The fact that it was more of a novel wasn't bad, either, because I still liked it. It was fun to see how the Bennett girls got their zombie slaying skills, and there was still a slight romance for Elizabeth with two fine young men. Pre-Darcy! Ahh! Sorry you didn't like this one as much. 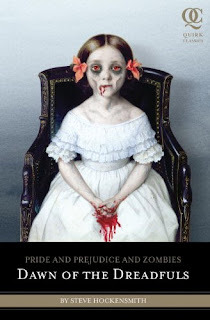 I still need to read Pride and Prejudice and Zombies. Thanks for the review! A look at my TBR!